If you like, you could set to show the process ID (PID) in File Explorer title bar, and see if a folder window is running under the shell process or as a separate process. This tutorial will show you how to hide or show the process ID (PID) in File Explorer title bar for all users in Windows 10. 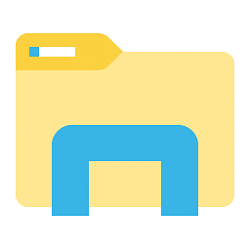 You must be signed in as an administrator to be able to hide or show the process ID (PID) in File Explorer title bar. If the folder windows are run under the default Explorer shell, the PID of File Explorer will display as (shell process: <PID>). If you have enabled Launch folder windows in a separate process, the PID of File Explorer will display as (separate process: <PID>). Normally, you can see the PID of a process in Task Manager like below. If an explorer.exe process includes the /factory parameter in the Command line column, then it means it is running as a separate process. The .bat files below will add and modify the DWORD value in the registry key below. A) Click/tap on the Download button below to download the BAT file below, and go to step 4 below. 4. Save the .bat file to your desktop. 5. Unblock the .bat file. 6. Right click or press and hold on the .bat file, and click/tap on Run as administrator. 7. Click/tap on Yes in the UAC prompt to approve. 8. You will now notice your screen flicker and a command prompt quickly opens and closes as explorer is restarted to apply the registry changes.